PRODUCT DESCRIPTION: Concentrate that comes in a "ready to spray" jug which mixes with water as you apply it when hooked to your garden hose. The jug is 32 oz jug with a "Hose End Sprayer" top. Cyonara is a good choice for a wide range of insect pests in both the yard and garden. Cyonara RTS is both low in odor and highly effective on many pests and is even labeled for use on vegetables in the garden. Just hook it up to your garden hose and it's ready to spray. COVERAGE: Coverage per quart will be from 8,000 to 16,000 sq/ft which is roughly 1/4 to 1/3 of an acre. 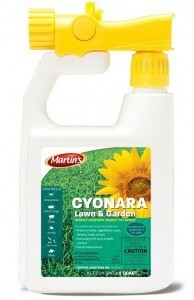 For larger areas, get CYONARA CONCENTRATE and use a HOSE END SPRAYER to apply it. This will prove more economical in the long run and the better choice if you're treating a 1/2 acre or more on a regular basis. WHERE TO USE IT: Lawns, ground cover, trees, your homes exterior, roof tops, vegetable gardens, flowers, bushes and vines. PRODUCT DESCRIPTION: This concentrate is just about odorless, works on all insects, is highly concentrated and can be sprayed safely throughout the yard on turf and plants. Use a hose end sprayer to apply it with the best sprayer being a 20 GALLON HOSE END. Pictured to the left is the 32 oz size which can treat up to 4 acres. 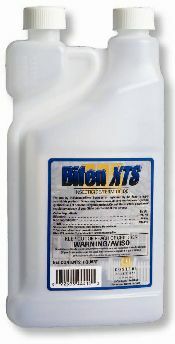 USE DIRECTIONS: Add 1-2 oz of Bifen XTS to the hose end sprayer and fill it to the 5 gallon line on the hose end sprayer listed below. Hook it to your garden hose and use the entire sprayer mixture to treat 5,000 sq/ft of area. Cyonara RTS demonstration on how to use it. Is this product safe to use with dogs? Yes. Now you do need to keep the pets off the treated areas until the treatment dries but this only takes 15-30 minutes. And once dry, there is no hazard to people or animals. In fact Cyonara is so safe, its labeled for use in vegetable gardens where crops will yield edible harvests. So walking over the treatment is not an issue for people or pets since its safe enough to be applied to plants which will yield crops we can safely eat. For more details on how safe it is to use, view the video above which covers all the standard preparation work you need to do for making a safe application around the home. I would like confirmation that Cyonara kills noseeums. I live in Central Coastal Florida, and noseeums are the bane of our existence. Also, we have large numbers of Anole Lizards that populate the areas near where the noseeums might live/breed. We would like to spare the lizards, as they are effective at controlling other insect populations. Will Cyonara harm the lizards? Cyonara will definitely kill noseeums. But as our article explains, it can be difficult to get all areas noseeums will use for nesting so in general, liquid sprays should only be used when you need to treat small areas like 2500-5000 sq/ft. So if you have a large sized lot, like say 10,000 sq/ft or more, fogging is by far more effective and the preferred method of treatment. It takes a lot less chemical to treat using a fog (just 1-2 gallons of mixed solution to fog an acre but when liquid spraying, 10-15 gallons per acre) and overall, fogging is more effective on noseeums because of their small size. Lastly, Cyonara (along with the other products we have listed in our Noseeum article) is an insecticide and will not impact reptiles, amphibians, etc. In other words, using Cyonara will not bother or impact your Anole lizards in any "bad" way. @admin: Thank you for your prompt reply! Assuming there are no issues with Cyonara's hose-end sprayer (Cutter's product does NOT kill noseeums and they're hose-end sprayer often does not work), I think Cyonara is the way I would prefer to go. We have a pool/deck surrounded by 6' wide strips of grass and flower/plant beds. I need to be able to control the spray in those areas to avoid getting it in the pool. Our total lot size is less than 1/3 acre. When one deducts for the house, pool, deck, driveway and paved neighbor's easement, Cyonara should cover just fine. Question: Have any studies been done to determine how far noseeums can fly? Just curious. Based on the size of the lot, you are right; the Cyonara should suffice. The key is getting the noseeum "pockets" treated and since you don't have too large of a lot to maintain, there is no reason for you to struggle getting any key areas treated. As for what to look for; key areas are generally moist, damp, shady areas where they can rest, hide from the sun, lay eggs, etc. It only takes a few such areas to develop a problem and from there, attacks will occur. As for their flight patterns; it isn't that far. But they don't rely on being able to cover great distances to find targets. Unlike horse flies or tiger mosquitoes, noseeums rely more on numbers to target prey. So what they'll do is invade an area slowly, usually from adjoining properties, and they'll do this over and over. So if an adjoining property has a healthy population that can feed sufficiently, they'll keep at it all the while spreading over into neighboring properties every time they reproduce. And since they reproduce daily, there can be a never ending supply migrating to your property almost daily. In the end, identifying any nearby neighboring property that might be the source could help. At that point either getting the property owner to treat or deciding to treat the area yourself could prove helpful and in many cases, problem solving. We have noticed a heavy population of Miller moths around our home this summer. It has been an unusually wet summer in Wisconsin and it seems they are clinging to the siding, screens and looking for ways to get inside. Imagine my surprise (and disgust) when I noticed brown secretions on our roll-up vinyl blinds on our screen porch and rolling them down to clean them discovered 30-40 moths under EACH window blind. (The blinds are installed on the outside of our screen porch.) I staged war with them as they flew all over me and the area. I've had to repeat this a couple times although there are not quite as many. I also found a pocket of them behind a flower box that is attached to our siding. I believe they are responsible for some shrubbery and flowers looking lacey and not doing well. I'm looking for help in controlling these moths. Would the Cyonara be the best product for this? I would appreciate your input. Thank you! Cyonara would be a good choice to get rid of these guys. It's commonly used on siding and plants for a wide range of pests including miller moths. Treat weekly until they're gone; once every 2 weeks during the fall to insure they don't lay eggs everywhere. Now if they remain persistent on your blinds, you may have to upgrade to the stronger formula listed in our Miller Moth article. Its a concentrate you'll have to mix with water to apply but we find it works a little better for stubborn problems. Hi – It looks like I have lots of Clover mites on my pool deck and right alongside my house – It looks like Cyonara would be a good choice??? Would this stain my Limestone?? No need to worry about staining. Cyonara will go on odorless and though the area will look "wet" like you sprayed it with water right after treating, as soon as it dries it will go back to how it was before spraying. And this will be true for all surfaces you want to treat including plants, cement, vinyl, wood, etc. Yes, it works! I don't use pesticides as a rule but the no-see-ums have been horrible this year so I acquiesced after a few weeks of getting eaten alive on the way to and from my garden. Spraying the ground sounded better than using repellent on myself every day. This product worked perfectly. It not only rid the area of no-see-ums, it also got rid of yellow flies and mosquitoes (I sprayed into the brush and up in the saplings and trees that line the property). That was over a week ago and I'm still having no problems when I go to the garden each day. I only gave Cyonara a 4 star rating because the container is solid white and I was unable to tell when I ran out. The product itself is excellent. The army worms have not made their way to my flower (perennial) garden, yet. Will this spray keep them away? Or only kill the ones that are present? Will the spray ruin my flowers? Cyonara won't "ruin" any plant. In fact its labeled for use on just about any kind of flower, ground cover, tree, etc. including garden vegetables so its fine for use around the home for a wide range of pests. That being said, it works best at killing pests once present compared to "repelling" them. But you can try to see if it will be strong enough for your need. If not, get some cypermethrin and use a hose end sprayer to apply it. Cypermethrin is highly repellent to any insect and they'll avoid where its been sprayed for sure. It too is safe for use on all plants; apply it at the rate of 1 oz per gallon per 1000 sq/ft of yard. Skinks are getting in my house and I would like to know if Cyonara works on removing them or their food source from around my home. No doubt the Cyonara will get rid of their food. And if you spray with some Pest Rid 1-2 days after treating with Cyonara, I'm sure they'll be gone for good. AWESOME! Product is exactly what I was looking for. After only one application, all flying pests were gone. Our yard was overrun with noseeums and flies. You could actually see the pests fleeing from the spray. It did not harm our pets, grass or plants. This product was a life saver. We can now enjoy our yard again. Is cyonara safe for vegetable gardens (tomato, squash, cantaloupe, beans, peas, etc)? How long after spraying for safe harvesting? Also, will cyonara kill garden pollinators, such as honey bees or bumble bees? Will cyonara kill fire ants? Now does that mean it won't work if the vegetable is unlisted? No. The main reason most vegetables aren't listed is simple; its not possible to list every vegetable on every label so companies will choose a few "main" pests and main target sites and thats it. So with that being said, you should expect to achieve good results using Cyonara on squash, beans, peas, etc. for pretty much any pest they might attract. I say this because we have heard from many customers using it that they were able to control anything eating their gardens. As for days to harvest; the label lists a wide range (1-21) so you'll have to refer it to specifics depending on what pest you're targeting, etc. Regarding fire ants; the label includes fire ants and we know it will kill them. Lastly, regarding pollinators like bees, Cyonara can kill them. But in order for this to happen, you'll have to target them at their nest site. So in fact we sell a lot of this product for use in turf to treat digger bees and wasps. In these scenarios we know they nest there so we're spraying their nests directly. This direct treatment will not deter the bees. They'll actually keep using the site which in turn leads to their certain death. But when Cyonara is used on plants they might land on, it works as a repellent only. This happens because bees and wasps will readily detect its presence. So if you spray plants they like to visit daily, they'll actually notice the treatment immediately and simply avoid the plant. This defense mechanism will keep them safe so they won't succumb to the active. In other words, any pollinator foraging on treated plants will readily detect the chemical and once that happens, they'll stay away and survive fine. I have a black oil blister beetle infestation with horses on property of three acres. Will this product do the job? Rocky property, very short grass pasture. Thanks. Getting desperate here. Lost one pony. Cyonara would work well. One quart would cover up to 1/2 acre but because it needs to be applied via a garden hose, I'm not sure if you'll be able to get a treatment over much of the 3 acres (unless you have a real long hose!). For this reason you may consider getting the Essentria. Its concentrated and can be applied using any standard pump or power sprayer. You could also get the Cyonara concentrate (link is above) and apply it via any power spraying rig. But without knowing how much of an area you want to treat of the 3 acres, its hard for me to say which option would be best. It basically comes down to how much are you wanting to treat because all the concentrates listed in our article will do the job. Can your product kill midges in pine bark mulch? Definitely. In fact it can be used on plants, mulch, flowers, etc. which are all common places for midges to use for both roosting and nesting. I've just used the hand spreader to apply the Bifen granules. I'm ready to apply the Cyonara, but I'm having trouble figuring out how to switch the nozzle "on". There's a vertical piece of plastic that blocks the nozzle from turning. Should I break that? The video above may help with more detail (the one to the left side of the page) but to answer your question; there is a small plastic tab that must be "snapped" off to allow the on/off switch to function. I just released some beneficial nematodes. Will this product harm them? In general, no. In fact nematodes occur naturally and for many farmers around the world, they're a big problem. For this reason, chemical companies have created a range of products that target nematodes. Known as nematicides, these compounds are quite different from insecticides. Long story short, once mixed with water and sprayed over turf, most any insecticide won't impact the local nematode population. Using both the Bifenthrin and Cyonara, I have finally got a hand up on these little devils. Very tough and I tried so many things before I found your website and products. Thank you for your help! Good product; very effective. Noticeable difference after applying. Thank you! Excellent product! This product worked very well in conjunction with Bifen granules to treat a springtail problem. The problem was eradicated within two days. What is the impact to honeybees? Permethrin is toxic to them I understand. Most every insecticide is "toxic" to any insect so true, Permethrin can kill them. But so can everything else we sell. But its important to understand two things relative to this fact because in general, the only way to kill bees is to intentionally target them. Let me further explain. The first important point to consider when treating is what you're targeting and where you're spraying. So for most people using Cyonara, they'll be targeting turf. Since bees don't generally "hang out" in the grass, such applications usually won't bother them. But if you use Cyonara on flowers or bushes bees like to visit, they could be impacted which leads me to the second important point to understand about pesticides. So the second point is that Cyonara uses an active insects will readily detect. This means Cyonara, like most pesticides, is highly repellent to insects. Where applied, insects will avoid and this is especially true when it comes to bees because they are super sensitive to insecticides meaning they are very much aware when any are applied. So regardless of where you spray, what will no doubt happen is that the local bees will stay away and definitely not land on any treated surface. Now obviously if you spray a bee hive directly, you will kill many of the occupants if not the whole nest. But if you're treating your turf, pine islands, etc. around your home, it won't affect them. They will even continue to visit your flowers (assuming you don't spray the flowers) so the net impact will zero. Long story short, most all insecticides are able to kill most any insect including bees. But when used properly, most won't have an impact on the local population unless one uses the product in a way that's very much intentional. The product actually works! I tried so many things to get rid of the gypsy moth caterpillars! However, only CYONARA RTS 32 oz helped! Of course the wind brings more into our yard; but after I sprayed the yard and the house with the product, I didn't see any caterpillars or other bugs for over a week. I found this website a few years ago while looking for tips on pest removal. I am very glad I did because not only does this site offer numerous products to help take care of business, it also offers pro tips and suggestions for which product to use for different purposes. I now buy Cyonara every year to combat gnats, mosquitos and other bugs that enjoy ruining back yard outings. 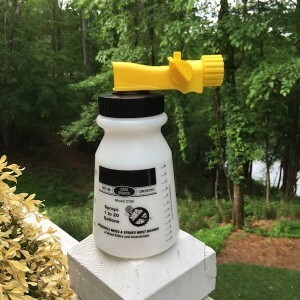 The ready to use bottle is extremely easy to handle and as simple as attaching to your hose and pointing where you want to spread the product. I use it in combination with the pesticide grains that I spread through my yard, flower bed and mulch. Great product. I highly recommend using Cyonara and using the info on the site to help make perfect combos to rid summer nuisances! Will this product help with springtails? I am about to lose my mind with them getting inside of our home and on the outside columns of our house. In the article, you'll see that for outside the home, you'll need to apply the listed granules once a month and then spray the ground and homes siding with Cyonara as needed. This could be several times a week if they are being seen or maybe just 1-2 a month once they stop coming back. But think of the granules as the agent getting the springtails developing down in the ground and the Cyonara as the agent killing the migrating springtails you visually see. Inside the home you'll need to spray Cykick aerosol where activity is found. And if you see them coming up from the sink, then you'll also need to use the Survivors down the drain. So for inside the home, the Survivors is to the drain as the granules are to the soil around the home. Following this logic, the Cykick aerosol if for treating inside the home as the Cyonara is to be used around the outside of the home. Long story short, you'll need to spray outside with Cyonara whenever you see live springtails and in the home, with the Cykick when they appear. But for longterm, sustained control, the granules outside and the Survivors down the drain if seen in sinks, tubs, etc. Cyonara has worked quite well for me. I have a big problem with daddy long legs spiders and this product has them on the run, as well as other insects. It seems to keep the spiders away for about 4 weeks which is very helpful. The hose end sprayer is very easy to use and very convenient. I live in central Florida and I’m having a huge skink problem, they are in my brand new shed which is clutter free and clean. I do my crafts out there and house our motorcycles. We even have a window unit air conditioner. These things freak me out! I can deal with the regular fla lizards but these things have to go. I am worried that they are going to draw snakes into my yard which would send me over the edge. Please tell me exactly what I need to order, and I will right away. Thank you for your help! If you refer to our Skink Control article, you will see we have detailed the treatment program needed to get rid of them from the shed and yard. 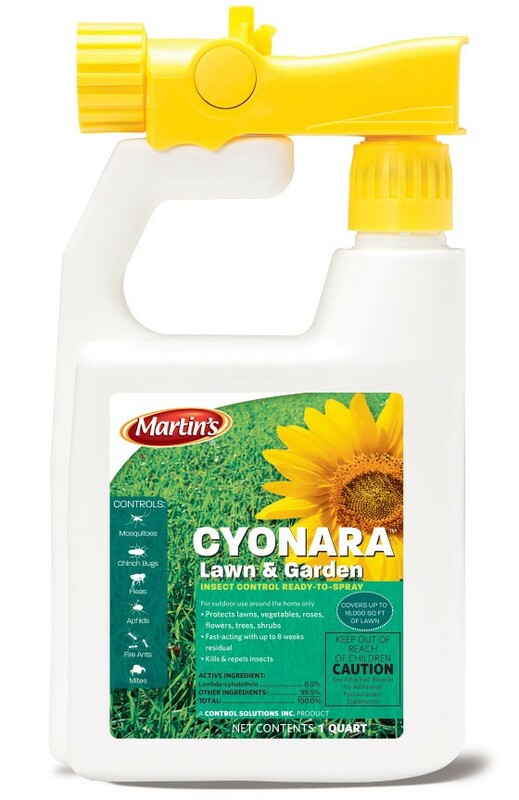 First, spray the shed and yard with the product above, the Cyonara. This will effectively take away the food they crave and must be finding around the shed. Do this in the morning and let it sit for at least 3 hours before applying the Pest Rid which chases away the skinks. Second, apply the Pest Rid Granules around the shed using 1 lb for every 250 linear feet of ground. You many want to apply them around your home too if you don't want lizards there either. Lastly, spray over the granules with Pest Rid Spray. After the granules are sprayed with the liquid Pest Rid, spray the inside of the shed focusing on the baseboards and any other points of entry. Let this inside treatment sit for at least 1 hour before spraying the outside of the shed (and home if you want to protect it too). Use 1 quart of spray for every 125 sq/ft of area. I’ve been dealing with heavy infestations of Oak Leaf Gall Mites on a giant backyard oak for 4 years. My reactions to the bites have become severe and we need to find a solution to this ASAP. If it were up to me I’d take the tree down but I live in a rental and my landlord will not remove it. I read your treatment suggestions to spray the tree in April, June and August. Is this schedule appropriate for the Dallas area/seasonal weather? The leaves on this tree don’t usually start turning until September or October and continue to fall through January. Last year I was still getting bitten in late February. Thanks for your help. As explained above, the oak leaves don't "fall" like most tree leaves. But they are dying or dead as winter sets in and takes hold. During this time, the galls release which is why people tend to have the worst issue from December through spring. So for immediate relief now, treat clothing and your home as explained above. These treatments done now will offer relief keeping them under control at least in your living environment. As for the outside treating of trees; starting in April would be wise. Plan on spraying them with the Cyonara once a month from April through October and this will control/stop any development in your yard. We have a large yard with a lot of English ivy covering. We had so many mosquitos last summer and were thinking that maybe they’re nesting in the ivy. We are also concerned about ticks since we had so many deer visit us in the fall/winter. We are considering this product to help with the mosquito problem. Would it also help against ticks? Also, do you think that removing all the ivy would truly help reduce the mosquito population? If you read our Mosquito Control, you'll see this is a viable option to use. That being said, its only good for small areas, say 5,000 sq/ft or less. This is mostly due to the way mosquitoes behave. Its not that the spray won't kill them. It will. The problem is that its hard to cover everything when using a liquid spray. Now if you take some time to review our online article, you'll learn more about fogging and why its so good. Basically fogging will be way more efficient. Its super fast, uses 1/10th as much chemical and covers all landscaping plants so the mosquitoes can't hide. This means in 1-2 years, the savings in chemical will more than pay for the cost of the equipment. Long story short, if you're treating 5,000 sq/ft or more, fog if you want to keep all your plants they way they are because even if you were to remove the ivy, you'd still have mosquitoes. But if you start fogging you will be able to grow any kind of plant and not have to worry about bugs as it does such an awesome job controlling everything. Will spraying this product on my patio help with springtails as well as small beetles? I live on the second floor, in a building, facing the woods so I cannot treat the outside with granules. My patio/balcony is covered with springtails! I am doing everything that is recommended on this website to control springtails on the inside of my home but some are still getting inside. What can I do to control the outside of my condo? Spraying the Cyonara above on the cement and any side of the building you can access will certainly help. Just be sure to monitor the siding. As soon as they return, spray again. For some of our customers with limited access like yourself who are not treating the ground below, they are reporting that spraying twice a week will usually keep them under control. I bought this product to see if it would help us with an elm seed beetle invasion. We used the spray and sprayed everything down and it really seems to work wonders! We have seen less of them since we sprayed. We had tried everything and nothing worked then I came across this product in a search and decided to give it a try. I am very pleased with the results and can't thank you enough! I will probably be ordering more. It was very easy to use and the directions were straight forward. Can I spray Cyonara Lawn & Garden on my Linden trees to control Japanese beatles?. Is it safe for this type of tree? Cyonara is so safe it can be sprayed on garden fruits and vegetables grown to be consumed by people. So to answer your question; yes, its safe for your Linden tree and any other tree. In fact, Cyonara was created for the sole purpose of saving your trees, shrubbery and other plants from destructive insects. I am having a problem with Springtails I see them mostly on my white siding and all along the tops of the white PVC deck rails. They are probably on the deck boards as well, but they are a dark color and I don't notice them. I plan to use the granules and I feel like I should spray this right on the deck railings and my siding, but will this damage or discolor my Fiberon Composite Decking? When used properly, Cyonara will not discolor any surface. Its actually labeled for use on garden fruits and vegetables and only the safest, non-impacting sprays enjoy such labeling. The only "residue" you might see would be water spots, like those that might be left if you were spraying water from your garden hose if that was to leave a visible residue. And if it did, you could easily wipe it away. But there will be no trace of the chemical since there is only a few ounces being used per gallon of water. When you spray the leaves on trees that Japanese Beetles like, does the CYONARA spray coat the leaves so when the beetles return to eat the leaves, what happens – 1). They leave & do not return – or – 2). They consume some of the leave & die. How often to you have to respray to get through there feeding stage , assuming a rain does not wash the product off the leaves. Also , what precautions do you have to follow while spraying the concentrate with a hose attached? How far does the concentrate bottle spray on a straight steam to reach the tops of trees? Please advise . Just like millions of other concerned tree & plant lovers , these beetles are quite a concern to me on how much damage they can do. Cyonara works two ways. First, it will kill any insects on the plants you spray and do so in very little time. Second, it will keep insects away because its naturally "repellent" to insects. Cyonara is safe enough and labeled for use on vegetable gardens, fruits and vegetables. But don't let this liberal labeling trick you into believing its weak. In fact its plenty tough to handle Japanese beetles on roses as well as ornamental trees like cherry and Bradford pears. Second, once applied, it will adhere to the plant leaves. This trace residue is strong enough to hold on through normal rain patterns and its natural repellency will keep the Japanese beetles away for 1-2 weeks if not longer. Precautions are the same when spraying insecticides, fungicide or herbicide: wear goggles if spraying up so to prevent some from entering your eyes and wear rubber or surgical gloves. Standard goggles or our face shield are very good to use for this task. As for how far the sprayer will spray? This depends on your hose. Since the sprayer works like any common adjustable sprayer, it will generally reach as far our and up as any spray guy you've used on your hose before. At my home the water pressure is quite strong so it can reach 28-30 feet up. But I've been to homes where the pressure is low and it can only reach 15-18 feet. We have lived in N California for 49 years and the only pesty insects have been yellowjackets until last year when we started getting insect bites galore. This year is worse. We assume they are noseeums as we never spot any insects on us or on our clothing. I have tried a dynatrap to catch the noseeums but don't see any effect on the bugbites, the trap just fills up with moths and miscellaneous bugs. I plan to use Cyonara with a fogger to try and protect against these noseeums. However, our garden is specifically set up to attract butterflies and humming birds and my question is will the Cyonara kill the butterflies? Cyonara sprayed over the landscape in one of our fogging machines will no doubt control noseeums as well as other flying pests that might be nesting like biting gnats, mosquitoes and more. It works fast and is highly repellent to insects so treatments can last several weeks. As for the impact on butterflies and humming birds; there will be no impact unless you spray the butterflies directly. First, hummingbirds won't be affected at all as the active won't impact them when used properly. In this case, you're dispersing so little over such a large area, there won't be enough chemical in the landscape to impact them or any other bird or mammal in any way. Personally I fog my property on a regular basis and I actually fog the hummingbird feeders as this keeps away nasty pests like wasps and ants who pose a direct threat to hummingbirds. Our hummingbird feeders are as active as ever and if anything, the visiting birds are happier due to our treatments. As for butterflies; they will fly away from you as you're treating so it will be hard to spray them directly. At least thats what they do in my yard. And once the chemical is sprayed, they'll avoid treated surfaces so there is no risk to them as they "know" where not to land. Now if you have specific plants they like to visit and you want to continue to have them visit these plants, you can avoid fogging them as well as lightly misting them with a garden hose after fogging to remove chemical residue. In my yard, I have an issue with miller moths which are destructive once they start nesting in turf and on plants. My fogging keeps them under control so we no longer have them eating our landscaping but I also see butterflies visiting a few shrubs which get watered with our irrigation system. No doubt the water is removing the chemical so the plants are no longer repelling the butterflies and this happens within 1-2 days of when I fog so I haven't noticed any change in the number of butteflies we see. Good product. Doesn't work on its own for springtail control but wne added to bifen granules or other types of spread, does a very nice job for controlling them. Company is great too – very helpful, reasonably priced and reliable! Thanks guys! I needed advice on how to rid the garden of chiggers and Bugspray was very helpful to provide emailed advice on the product and its application. It also came very promptly – and hopefully it's worked!